If you’re a road warrior that needs a special kind of briefcase that will endure hard times as well being able to carry a large assortment of items, then the McKlein USA Walton is up to the task. 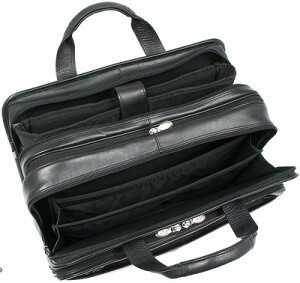 It’s featured at number 6 in our Top 15 Best Leather Briefcases Comparison Chart. 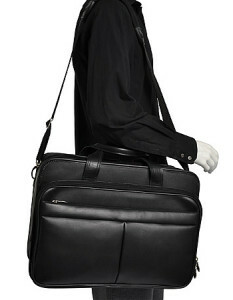 I’ll be going in-depth on all aspects of this bag, from its material and durability, to its size and capacity. 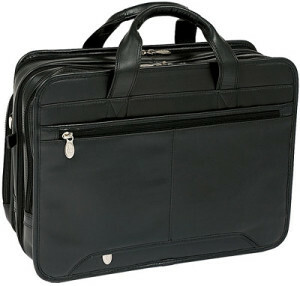 Read on and find out in my review whether this briefcase is ideal for you. Highly durable full grain oil tanned leather construction. Lots of compartments with a large capacity. Fits Laptop Screen Size Up to 17"
Dimensions (inches) 17.5" x 13" x 7.5"
Durability and capacity is in essence, what the McKlein USA Walton leather briefcase is all about, and you can see that in its appearance and functionality. It’s constructed a nice and smooth full grain black leather finish which gives a professional appearance, making it ideal for city workers and business travelers. The overall consensus of this briefcase is that it’s able to endure a lot of bumps and bruises and still manage to maintain itself. This is thanks to its sturdy reinforced edges of the bag which has a rubber-like protective material that absorbs shocks. 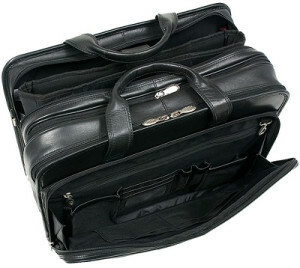 There’s nothing more annoying than carrying around an uncomfortable bag or briefcase throughout a long journey. Fortunately, the designers at McKlein USA Walton understand this and have incorporated several features to make your travels more comfortable. Firstly, the carry handles are also made entirely of leather and are fairly large and well stitched, making them easy to grip. Secondly, the shoulder rest on the shoulder strap is made of neoprene which not only is comfortable to wear, but it’s also non-slip and absorbs shock. This is very useful since it will reduce the amount of stress on your shoulder. If you’re also traveling around with a rolling briefcase, there’s a zipped opening at the back of the briefcase that allows a telescopic handle to be inserted, so you can easily roll around with both briefcases. Although this briefcase is larger and heavier than most out of necessity, it’s still compact enough to be considered a personal bag which you can bring on the plane with you to fit underneath your seat or in the overhead compartment. If you’re looking for space, this briefcase has plenty. All compartments are organized thanks to its dividers, so you should never have trouble looking for things. Starting with the first zipper section at the very front of the briefcase, which opens up to provide a slim compartment which is good for storing small items such as cellphones and passports. 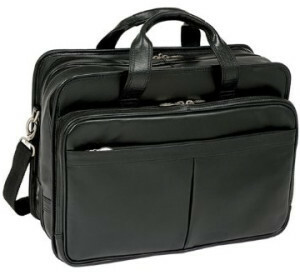 At the very back of the briefcase is another zipper section around the same size as the one on the front, which also allows small items to be stored and quickly accessed. There’s a front organizer compartment that is not as big as the upper main compartments, but is still able to open up quite wide. In here, there are holders for your pens, cards, cellphone and other accessories. There’s also another slim zip compartment just above all of the organizers. The first main compartment has two dividers which expands to provide three separate file storage spaces. Each section expands around 2-3 inches giving an adequate amount of space. The zippers at the middle are actually for expanding the briefcase about an inch to provide yet more capacity if needed. The second main compartment towards the back of the briefcase is where you can store up to a 17” laptop within the detachable sleeve which is padded with high density foam to ensure safeguarding of your laptop. The fact that it’s removable makes it ideal for airport scanning. It’s hard to imagine how the McKlein USA Walton leather briefcase wouldn’t be handy for someone who has to carry a lot and travels frequently. It’s practically a perfect match given the large capacity, travel friendly design and sturdy construction. However, if you prefer a briefcase that’s slightly lighter and smaller but has the benefits of travel friendly features and good capacity (albeit not as much as this briefcase), then you should also check out the Samsonite Leather Expandable Briefcase.